6/28 Cup of Coffee: The improbable rise of Aaron Wilkerson (pictured, left) continues, as the unheralded, undrafted product of the United Baseball League continues to befuddle the Triple-A competition. 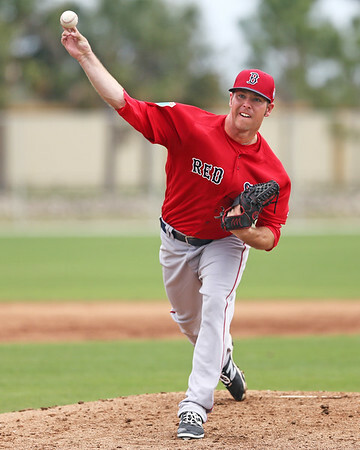 Greenville and the GCL Red Sox also got strong pitching performances in their victories. Lowell dropped its second straight after winning its first nine games, Portland fell in a rain-shortened contest, and both DSL squads prevailed in slugfests. In July of 2014, the Red Sox signed an undrafted 25-year-old right-hander out of the American Association, seemingly to fill some needed innings on a shallow Lowell Spinners pitching staff. Less than two years later, Aaron Wilkerson is dominating Triple-A and appears at the cusp of getting a chance to eat innings on the shallow Boston Red Sox pitching staff. Wilkerson allowed two runs on four hits in seven innings, striking out eight without issuing a walk. He allowed two solo home runs, one to rehabbing slugger Miguel Sano (MIN). In 41 innings across eight Pawtucket appearances, Wilkerson now sports a 2.20 ERA, 1.07 WHIP, 49 strikeouts, and 10 walks. Wilkerson was supported by an offense led by Henry Ramos, who was 2 for 5 with four runs driven in. The big hit was his two-run triple in the third inning off Rochester starter Pat Dean (MIN), who allowed only one run in a start against the major league club two weeks ago. Chris Dominguez hit an eighth-inning solo homer to provide an insurance run for the PawSox. Before the rain came, the Sea Dog lineup was unable to muster any sort of attack. Of the team's three hits, two came off the bat of Sean Coyle. Since his previous multi-hit game on June 6, Coyle had been mired in a 5-for-50 slump. Neither Yoan Moncada or Andrew Benintendi reached base for Portland. It was only the second time this season where the two were in the lineup together and failed to reach base, the other coming on May 7 while the pair was in Carolina. Keith Couch took the loss, allowing three runs (one earned) in four plus innings. Salem's second half home opener was postponed due to rain showers. The two will play a doubleheader on Tuesday at LewisGale Field beginning at 5:00. Big right-hander Dedgar Jimenez turned in his second consecutive strong outing to lead the Drive. Jimenez surrendered a run on four hits, matching a career best by going seven innings. He struck out six and walked only one. Jeffry Fernandez and Adam Lau both tossed a scoreless inning of relief apiece. Kyri Washington led the offense, going 2 for 4 with an RBI. He also doubled, stole his 10th base of the year, and was intentionally walked. Austin Rei also doubled, while Jeremy Rivera was 2 for 3 with a pair of runs scored. Luis Alejandro Basabe was 1 for 4 with a walk and pair of runs driven in. After winning their first nine games of the season, the Spinners dropped their second straight on Monday night. Daniel Gonzalez struggled, allowing five runs (two earned) on seven hits in four innings. He struck out four and walked two. Sixth-round draft choice Steve Nogosek made his professional debut, allowing a run on two hits in the fifth. The former Oregon Duck closer was ranked the 164th-best player in the draft by Baseball America. Daniel Zandona pitched the final four innings, giving up two runs on five hits. Tucker Tubbs continued his white-hot start to the season, going 1 for 3 with a triple, walk, and a pair of RBI. The 2015 ninth-round selection is 9 for 16 with four extra-base hits and six walks in his last five games. Tubbs was not the only ninth-round pick to triple for the Spinners, as 2016 draftee Matt McLean also ripped a three-bagger as part of a 1-for-4 night. Left fielder Tyler Hill doubled, scored a run, and walked twice. 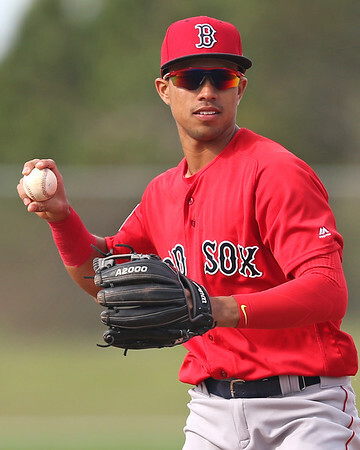 An 11-hit barrage by the GCL Sox was led by Stanley Espinal (pictured, right). The third baseman went 3 for 5 with two doubles, two runs scored, and three driven in. Nicholas Hamilton reached base four times, going 3 for 3 with a walk and a double. Marino Campana had a pair of hits, and Brennan Boesch was 1 for 4 with a walk as he continues his rehab. On the mound, Max Watt allowed a run on five hits in four innings. The six-foot-eight righty struck out four without walking a batter. Jorge Marban allowed an unearned run and walked a batter in his inning of rehab work. Angel Padron, in his first appearance since his promotion from the Dominican Summer League, fired three scoreless innings. Padron hadn't allowed a run in seven innings across four appearances in the DSL. The Sox combined eight hits with seven walks to prevail in a slugfest. Ramfis Berroa blasted his third home run of the season in the fourth inning. Eduardo Torrealba was 3 for 5 with three RBI and a pair of runs scored. Simon Muzzioti, the team's highest-rated prospect and one of its most consistent offensive performers, was removed from the game in the third inning for a pinch runner following an RBI single. No word at this time whether Muzzioti left with an injury. Alejandro Rodriguez got the win, allowing three runs on seven hits in five innings. Juan Florentino struck out all three batters he faced in the ninth to earn the save. On an afternoon of parallels, both Red Sox DSL affiliates outslugged an Astros affiliate to move to 15-5 on the season. Every member of the Sox offense had a hit as part of the 12-run, 13-hit barrage. Albert Guaimaro, ranked 15th in the 2015-16 international class by Baseball America, delivered his first professional home run. The two-run shot in the fifth gave the Sox a lead they wouldn't relinquish. Everlouis Lozada reached base four times and extended his hitting streak to six games. Jose Gonzalez got the win, moving to 3-0 on the year. Gonzalez allowed three runs on eight hits in five innings. Player of the Day: Even after putting up strong numbers for his first season and a half, there was a lot of skepticism about Aaron Wilkerson. As an older player in the low minors whose fastball rarely broke 90, that was understandable. Now, after posting a 2.00 ERA in 16 appearances between Portland and Pawtucket, he seems on the cusp of making the major leagues. With Eduardo Rodriguez optioned to the minor leagues after his very difficult outing Monday night, Wilkerson lines up as the likely option to make his major league debut in that rotation spot on Sunday.